It’s often said that cooking is like chemistry, or vice versa. So here’s a look at some of the organic compounds you can find in various herbs and spices. Whilst they are all a complex mixture of various organic compounds, this highlights those that contribute significantly to their taste, flavour or aroma. We celebrate Pi day with a poem. Why, you ask? Because it puts the PI in PoetIc, and that is your clue. Scroll to the end of the poem if you’d like the answer. Today, we take a quick look at two methods for computing pi using your humble PC. These two methods are infinite sums, meaning that the value of the sum approaches pi as you increase the number of terms added. Here they are. When I was young, I thought I could derive the value of pi as follows. Imagine a badly drawn hexagon as below. Every hexagon is the combination of 12 right angled triangles like the one shown in red. The following is known from trigonometry. If we extrapolate from a hexagon to a polygon of N sides, we get the following. Note that 2Nx/2r is the ratio of the hexagon’s perimeter to its ‘radius’. As N approaches infinity, the polygon approaches a circle and the value of 2Nx/2r should approach pi. I saw this in the supermarket the other day. Could this be an unintended reference to the co-inventor of calculus, now inadvertently immortalized as a biscuit brand? Apparently, this is not an error. 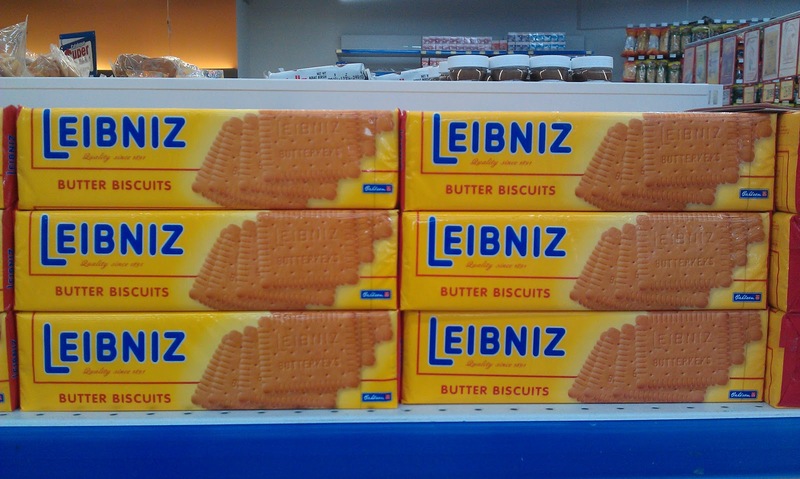 Leibniz biscuits are indeed named after Gottfried Leibniz by the Bahlsen confectionery company which makes them! A full FAQ on the subject is available on the Bahlsen website. Here’s some pertinent information translated straight from the german FAQ.